LEFT: The King, Jack, And Jester circa 1932. 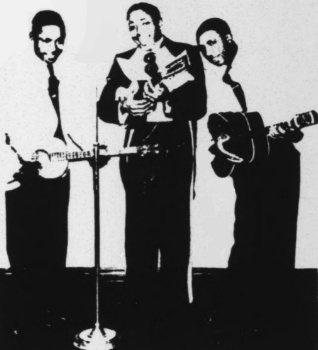 (L-R) Jerry Daniels (Jester), Ivory "Deek" Watson (King), and Charlie Fuqua (Jack). 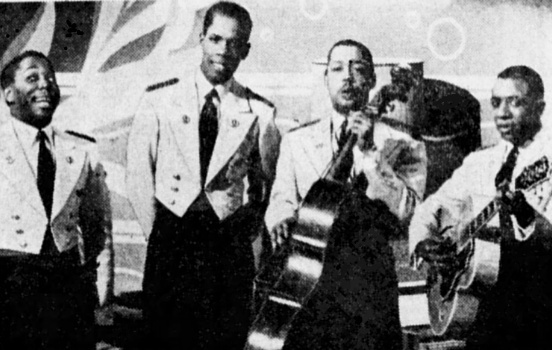 The question most asked by fans of the Four Ink Spots, who open at the Paramount theater Friday, is "What do all those words mean that you boys shout to each other during your act?" Billy Kenny, top tenor of the harmony quartet, answers for the boys. "We call them riffs. Suppose my partners, Goldenmouth Watson, Charlie Fuqua and Hoppy Jones, blend in behind me during my solo spot perfectly. I shout 'Home Cookin',' for what can be more perfect than home cooking?" NOTE: The above-right picture is from the 1942 movie "Pardon My Sarong" starring Budd Abbott, Lou Costello, and Virginia Bruce. (L-R) Deek Watson, Bill Kenny, Hoppy Jones, and Charlie Fuqua. They are singing "Do I Worry?"